For many independent and smaller manufacturers, it's difficult to create quality furniture at middle-of-the-road prices, something in between the Ikea items beloved by 20-somethings and the furniture on display in a store like Crate and Barrel. And consumers, who don't always know that they have plenty of purchasing options beyond the flat-packed box, often have incorrect expectations of what it costs to make good furniture and what they should have to pay for it. Modern consumers are used to buying almost everything via the web. They're also accustomed to online retailers disrupting traditional pricing structures. But this new paradigm hasn't transferred well to the furniture industry. Generally speaking, cheap furniture is cheap furniture. You get what you pay for. Buying online can't change that. Companies like Ikea can provide reasonable value at a low price due to economy of scale. Ikea produces mass quantities of each item, something that's not possible for most furniture makers. But it's not just quantity that affects price. The quality of materials and workmanship matter too. And for online furniture retailers, shipping becomes a huge factor. If you want inexpensive, Ikea is a good bet. The company offers high quality at low prices. If you want quality, be willing to “invest” several thousand dollars in a piece that'll last for years — maybe even a lifetime. If, like most people, you're looking for something in the middle, then shop at a local furniture store. That's where you'll find the best balance of quality and price. When it comes to furniture, I'm generally a “buy it for life” kind of guy. 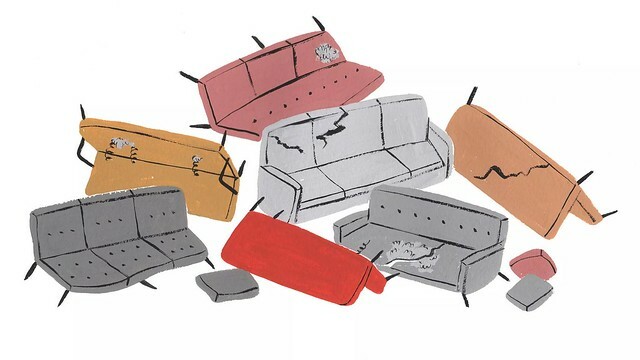 To me, furniture isn't a disposable product. Yes, I have plenty of Ikea items — I'm writing this while sitting on an Ikea chair at an Ikea desk — but I usually try to pick pieces that I think I'll keep forever. Nowadays, Kim and I have two approaches when shopping for furniture. How do you find affordable furniture? Do you tend to aim for low price — or do you prefer high quality? How do you find a balance? Have you purchased furniture online? What was that experience like? There are 9 reader responses to "Where to find affordable furniture". Man, I wish we had an Ikea here in Albuquerque, as not only are they cheap, they have that sort of minimalist aesthetic that I think would be fun to try out. But I’ve looked into it, and we’d need about a million more people for them to consider building here. Anyway, I live in a tiny condo, so I just bought whatever I wanted, seeing as how it hardly took any furniture to fill in my space. I went to places like Pier One, Ashley, La-Z-Boy, World Market, etc. 1. Can’t believe you didn’t mention watching out for bedbugs at a consignment shop – definitely be on the lookout. 2. Check Target and TJ Max/Homegoods – they often have Pottery Barn or Crate and Barrel aesthetic for a fraction of the price and quality level slightly above Ikea. Rachel–curious, not trolling–wouldn’t bedbugs be just as possible on a Craigslist item as a consignment store item? I’ve shopped at thrift stores since I was 16 and have never encountered bugs. I am fortunate to live by 2 Habitat for Humanity ReStores. I’ve found a piece or 2 at Good Will as well. Otherwise garage sales are great. Hand me downs from family. My favorite chair ever, a heavy solid wood frame and leather MCM armchair, cost $3 from a White Elephant sale at the local zoo. The only thing I purchased new for my house, was a custom made bare wood platform bed with drawers, from a local company going out of business. 5 years and 4 tenants later, and it’s still going strong. I prefer the look, quality, and history of vintage pieces. I just don’t have the space or the budget for the good stuff yet. I would also like to try my hand at carpentry and building my own pieces. I made a small bookcase out of wooden crates, in college for the apartment, and that was about it. I came here to mention Habitat for Humanity, too. The majority of my furniture comes from them – it’s definitely older style, but it will last much longer and didn’t cost nearly as much. I was able to buy my dining chairs for $3 each – can’t beat that! I had seen similar ones at various furniture stores for $150+ each. I also was able to find my bedroom set on craigslist from an older couple who were downsizing – you can’t beat a whole sturdy (real wood) set for $150. Hey JD – Congrats on getting back GRS! Awesome!!! I’ll come back here often now. I plan to procure most of our furniture for the Airbnb experiment from Ikea. Since it’s two states away, I’m kind of relying on places that can ship at lowish costs. I did manage to score a reasonable deal on beds from Sam’s Club online, uses my Mom’s membership. Most of my furniture is a hodgepodge of what JD mentioned above. I too prefer to buy furniture at local stores, and for the most part, that’s what we’ve done. One store sadly closed for various reasons, but we got a couch and loveseat for a song during their closeout sale. I paid full price for my bed at that same store at least 13 years ago and it’s still going strong. My current dresser is solid oak–it’s the same one I’ve had since I was a baby. :) A lot of our other furniture has been bought over time at a local mid-century modern (our favorite style) shop. The prices are generally very good for the quality (1960s) that you are getting. Our daughter’s crib was from Target, but we’ll be purchasing her bed from either a local furniture store or possibly giving IKEA a try. Her dresser was from another local furniture store–it was in their clearance section so we paid only a fraction of the price. I’d be interested in knowing the local stores you like :) Although the only thing we might be in the market for in the next year is a dining room table and Craigslist might suffice for that. We have gotten pieces from Brunke that are a bit pricier, but also “forever” pieces.